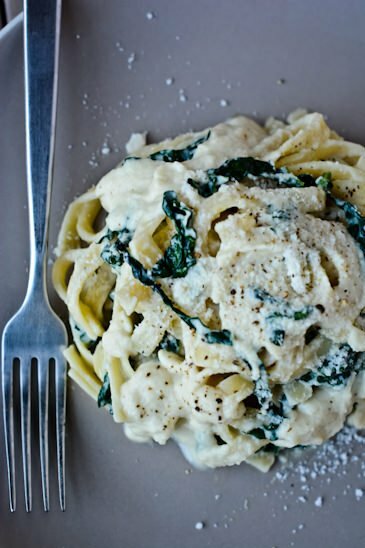 When I was younger I loved fettuccine alfredo, actually I loved anything that had lots of cheese and butter in it. I guess that’s why I always had a weight problem. One of the things I’ve learned over the years is that I can still eat delicious, decadent tasting food that’s still healthy, it just takes a little bit of creativity. I have seen lots of vegan and low-fat cauliflower sauces out there but most of them boil the cauliflower and then puree it in the blender. I wanted to see if I could up the flavor factor so I started with this recipe from Pinch Of Yum and started experimenting. I roasted the cauliflower for a little more depth and added some garlic and shallots to the mix as well. A splash of apple cider vinegar added just the right amount of acid to make the sauce pop. 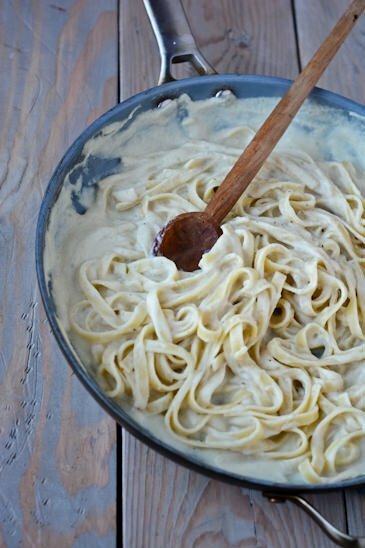 While it doesn’t exactly taste like a traditional Alfredo it was rich and creamy and totally satisfied the creamy saucy craving I had. I must admit that I didn’t let my boys know that the sauce was primarily cauliflower, I just told them there was cheese in it and they both loved it. 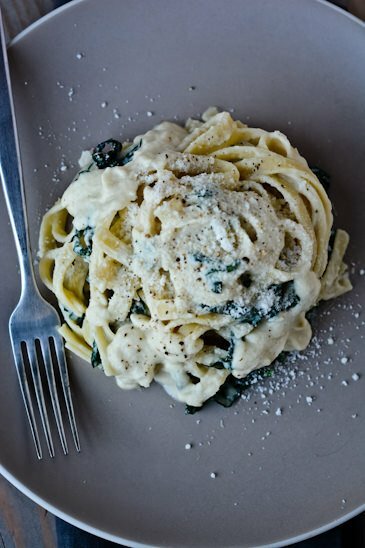 I served it simply with some sautéed kale and fettuccine but the possibilities are endless. I think it would be amazing with some butternut squash or mushrooms and it would make a great base for a pizza. To make this vegan just omit or replace the parmesan with nutritional yeast. 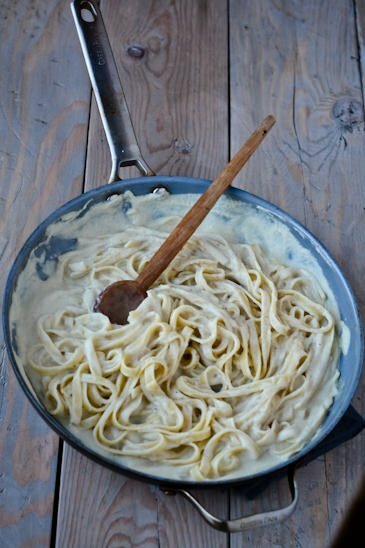 You'll never miss the butter and cream in this vegan pasta sauce. Roasted cauliflower shallots and garlic with just a splash of almond milk makes this the creamiest sauce you'll ever taste! 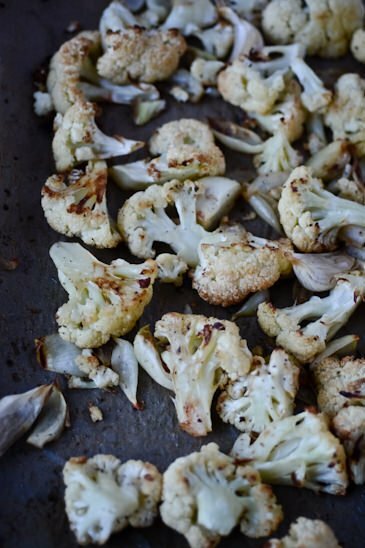 Place the cauliflower, shallots and unpeeled garlic on a parchment lined baking sheet. 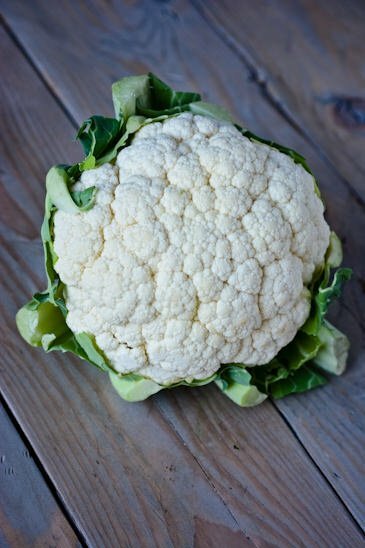 Toss the cauliflower with the 2 tablespoons olive oil and season with salt and pepper, about a teaspoon of salt and ½ teaspoon of pepper. Roast the mixture, stirring occasionally for 25 to 35 minutes or until the cauliflower starts to brown and the garlic has softened. Meanwhile prepare the fettuccine according to package directions. Heat the remaining tablespoon of olive oil in a large skillet over medium heat. Remove the tough inner stems from the kale and slice into ribbons. Add the kale to the pan and cook until the kale is wilted 4 to 5 minutes. Pick out the garlic cloves, discard the skins and add to a blender along with the shallots and cauliflower. Add ½ of the vegetable stock, the apple cider vinegar and almond milk and process until smooth, adding a cup of stock at a time as needed to get a nice smooth pourable sauce. You might not need all the stock so add a little at a time. Add the pasta sauce to the kale mixture and cook for a few minutes to heat it through and add the parmesan or nutritional yeast to the pan. Add the cooked pasta to the sauce and continue to cook until everything is hot. Taste and add more salt or pepper if desired. I could not agree more that nourishing, healthy whole foods are delicious but don’t have to be complicated. And like anything in life worthy of our time, take just a little effort and a shift in mindset. 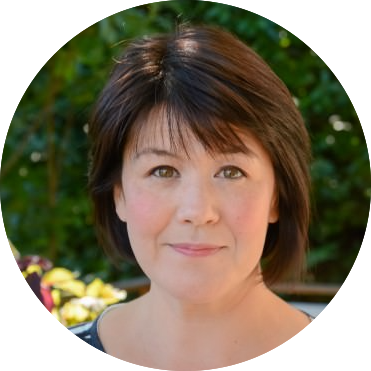 This is why I like your blog-I feel like we have a similar perspective and mission. 🙂 And I was just thinking about trying a cauliflower “cream” sauce too. This looks delicious, I like your idea roasting it first. 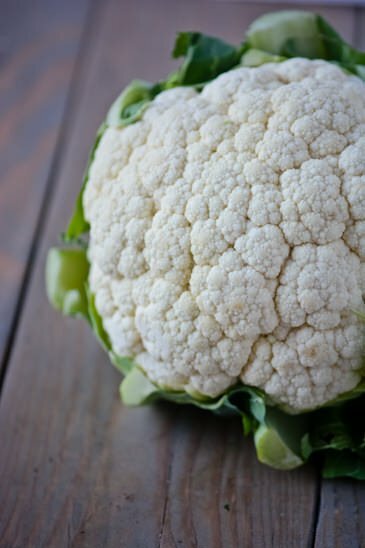 Yessssssss this looks amazing and I am such a cauliflower fan. Thank you for posting this. Could you use moo milk instead of almond milk? Yes, if you don’t care about it being vegan you could use milk or half and half instead of the almond milk. Thank you for posting this! We’ve been eating vegetarian in an effort to reduce our meat consumption but I felt like I’d hit the end of Pinterest recipes and was tired of the same old meals. I’m definitely making this recipe this week. I know that it can be challenging to cook meals without meat as the focal point but there are so many things you can do with grains, vegetables and beans that I usually don’t have too much trouble. I hope you enjoy the recipe if you try it out!